Europeans have a better opinion of President George W. Bush than they did before the Sept. 11 attacks, but they remain highly critical of the president, most of his policies, and what they see as his unilateral approach to international affairs. There also is a wide gap between the United States and Europe over the conflict in the Middle East, although recent U.S. efforts to forge a settlement there win broad European support. Americans, who are generally sympathetic to the Israelis, approve of the overall U.S. approach toward the Middle East. In contrast, people in three of four major western European nations — France, Germany and Italy — have been mostly critical of U.S. policies in the region, with the British public split on this question. Many more Europeans than Americans express sympathy for the Palestinians, and this is especially the case among well-educated Europeans. There are gaps of opinion over other U.S. policies as well. The president’s decision to impose tariffs on imports of foreign steel is condemned in Europe, but generally favored in the United States, at least by Americans who have an opinion on this issue. On the other hand, Europeans express overwhelming support for the president’s decision to increase American aid to poor countries, while a much more modest majority of Americans (52%) approve of this action. But in light of the U.S. public’s traditional opposition to foreign aid, it is noteworthy that a majority would support any aid increase. The U.S.-led war in Afghanistan enjoys strong approval among the publics of the four countries, and most believe that the United States is not overreacting to the threat of terrorism. 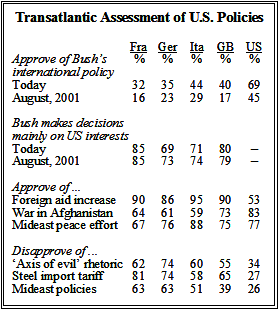 Even so, large majorities in each country think the U.S. is not taking allied interests into account in conducting the war, and Bush’s “axis of evil” rhetoric elicited a strongly negative reaction in France, Germany, Italy and Great Britain. The survey of 4,042 people in the four countries (along with 1,362 Americans), conducted April 2-10 by the Pew Research Center in association with the International Herald Tribune and the Council on Foreign Relations, finds major transatlantic differences over possible military action to end Saddam Hussein’s rule in Iraq. In the United States, 69% favor military action, compared with 46% in Great Britain and France and even fewer (34%) in Germany and Italy. However, the survey does show European publics potentially responsive to the idea of using force against Iraq if it is established that Baghdad is developing nuclear weapons or other weapons of mass destruction. Evidence of Iraqi involvement in the Sept.11 attacks also would be very important to a majority in Great Britain, but fewer in France, Germany, or Italy. The survey revealed considerable European support for taking a more independent course in security and diplomatic affairs. Majorities in France, Germany and Italy think western Europe’s partnership with the United States should not be as close as it has been in the past. People in Great Britain are divided on the question. European support for a more independent approach is not especially linked to negative reactions to recent U.S. policies, such as the steel tariffs. Rather, it is more associated with general criticism of President Bush, the feeling that the United States has ignored allied interests in conducting the war on terrorism, and general disapproval of U.S. policies in the Middle East. Not surprisingly, virtually all Americans (83%) approve of the U.S.-led military campaign against the Taliban and Al Qaeda in Afghanistan. Support is nearly as high in Great Britain, where 73% approve and 18% disapprove. Larger minorities in France, Germany and especially Italy dissent from this view, but majorities in all three nations agree with their American and British counterparts. Similarly, publics in every European nation, by more than two-to-one, reject the notion that the U.S. is overreacting to the threat of international terrorism. At least six-in-ten in each country say the United States is justified in being so concerned about terrorism. While they approve of the war on terrorism in general, citizens of these European nations are more critical when it comes to specific decisions the Bush administration has made. Opinion in all four nations is divided regarding the U.S. decision to try Al Qaeda prisoners before military tribunals, rather than in U.S. civilian courts (a policy Americans support by more than two-to-one). Roughly half in Britain, Germany and Italy approve of this move, while somewhat fewer (40%) in France agree. In both the U.S. and Britain, men are more supportive of the use of military tribunals than are women. In France, younger respondents are more troubled than their elders by military tribunals, while in Germany younger respondents are most likely to approve of this policy. The majority of western European respondents had a decidedly negative reaction to Bush’s labeling of Iraq, Iran and North Korea as an axis of evil. Just 17% in Germany approve of this concept, compared with 27% in France, 29% in Italy, and 32% in Britain. Nor is the American public unified over whether this phrasing is appropriate. Overall, 56% of Americans approve of Bush’s statement, while 34% disapprove. Partisanship plays a big role, as Republicans overwhelmingly endorse Bush’s remark while independents and Democrats are split. 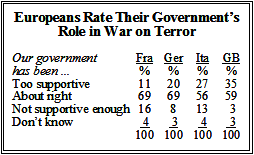 Most citizens in France, Germany, Italy and Great Britain are satisfied with their own government’s involvement in the war on terrorism. But significant minorities in Great Britain (35%) and Italy (27%) believe their government has been too supportive of U.S. terrorism policies. Despite their support for the military campaign in Afghanistan, Europeans strongly believe that their nations are not being given a seat at the table. 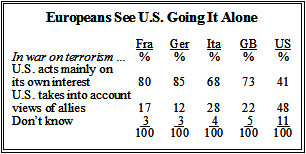 Fully 85% of Germans, 80% of French, 73% of British and 68% of Italian respondents say the U.S. is acting mainly on its own interests in the fight against terrorism, while very few feel the U.S. is taking into account the interests of its allies. In each nation, this view is equally strong across education levels and generations. Americans, on the other hand, are divided over the nature of U.S. leadership. While nearly half (48%) say the U.S. is incorporating the interests of its allies, 41% agree with the majority of Europeans that the U.S. is acting unilaterally. This latter view is particularly prevalent among Democrats and independents. The perception that the U.S. acts unilaterally is not a new one, however. In August 2001, most respondents in France, Germany, Italy and Great Britain also believed that George W. Bush’s overall foreign policy decisions were based entirely on U.S. interests, and did not take into account European views. Asked the same question today, public views are virtually unchanged. Only in Germany and Italy has there been an increase in the proportion saying the president is responsive to the allies, and even in these two nations, just a quarter view Bush as a multilateralist, with seven-in-ten saying he looks after U.S. interests only. While Americans, by nearly two-to-one (49% to 27%) approve of the president’s decision to place tariffs on steel imports, people in France, Germany, Italy and Great Britain strongly disapprove. The French, in particular, oppose this policy by roughly eight-to-one (81% disapprove, 11% approve). But not all Bush initiatives are viewed negatively in Europe. His recent proposal to increase foreign aid to impoverished countries wins almost unanimous support in Europe, although not in the United States. While modest, Americans’ support for an increase in foreign aid stands in stark contrast to most recent surveys of public opinion on this issue. As recently as January, Americans rated attempting to reduce poverty with foreign aid as the least important of eight possible approaches to combating terrorism. (See the Pew Research Center’s “Americans Favor Force in Iraq, Somalia, Sudan and…”, Jan. 22, 2002) Younger Americans express particularly strong backing for increasing foreign aid. Nearly two-thirds of Americans under 30 (65%) approve of this policy decision, compared with less than half of those age 50 and older. The unpopularity of many U.S. foreign policies, along with the perception that the U.S. does not take into account the interests of its allies when making foreign policy decisions, contribute to the widely held view that western Europe should take a more independent approach to security and diplomatic affairs than it has in the past. In France, 60% take this view, while just one-in-three think the partnership between the U.S. and western Europe should remain as close as it has been. Italians express a similar view, while the publics in Germany and Great Britain are divided more evenly on whether Europe should retain close ties with the U.S. or take a more independent approach. The divide on this issue in Great Britain is largely generational in nature. While those old enough to remember World War II favor maintaining strong ties with the U.S. by nearly two-to-one (61% to 32% among those age 70 and older), younger people in Great Britain lean toward a more independent course. A similar pattern, though less distinct, is present in France and Germany. In all four nations, highly educated people are the most likely to take the view that western Europe should be more independent in its approach to security and diplomatic affairs. For example, 68% of highly educated Germans would like to see Europe act more independently, compared with just 47% of those with low levels of education. Support among western Europeans for more distance from the U.S. is linked both to opposition to American foreign policy as well as to the perception that U.S. policymakers ignore European interests. By nearly three-to-one (71%-25%), European respondents who disapprove of Bush’s international policies and think America behaves unilaterally (a plurality in every nation surveyed share these views) would like to see western European nations act more independently in foreign affairs. At the other end of the spectrum, the minority who both approve of the president’s international policies and think the U.S. takes European interests into account believes that the partnership between the U.S. and western Europe should remain as close as it has been. This pattern is consistent within each of the European nations polled. People in France, Germany, Italy and Great Britain are nearly as worried as Americans are about the possibility of Islamic terrorist attacks in their countries. While two-thirds of Americans are either very or somewhat worried about terrorism, majorities in each western European country surveyed share those concerns. In each country, women are significantly more concerned about the threat of terrorist attacks than are men, and older people are more worried than younger people. Despite these concerns, most think their own government is doing a good job in developing intelligence, law enforcement, and taking legal and financial steps to combat international terrorism. In France, seven-in-ten say the government is doing a good job, 61% of German respondents agree about their nation, and 57% of British also feel this way. Only in Italy is the public more divided, with 44% giving the Italian government good marks for combating international terrorism, and 40% giving bad marks. In all four European nations studied, majorities believe that the U.S.-led war against terrorism is neither increasing nor decreasing the chances of a terrorist attack in their country. But to a significant minority in Great Britain and Germany, the U.S. actions are making things more dangerous. One-third of British respondents say they think the chances of a terrorist attack in Great Britain are greater because of U.S. military action overseas. This view is more prevalent among younger and well-educated people in Great Britain. Just one-in-ten British say the war on terrorism is making their country safer. 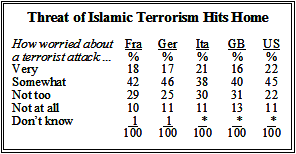 Similarly, more Germans think the likelihood of a terrorist attack in their country is increased, not decreased, by the war on terrorism by more than three-to-one (26% to 7%). Worries about terrorism are strongly related to views about the U.S.-led war on terrorism. People in France, Germany, Italy and Great Britain who are very worried about terrorist attacks are the least likely to think the U.S. is overreacting in its response to the Sept. 11 attacks, and are the most likely to support military action in Iraq as part of the war on terrorism. Yet those who worry most also think the war on terrorism is making things more dangerous for them. For example, 45% of Germans who are very worried about terrorist attacks in their country think the war on terrorism overseas has increased the chances that such an attack will happen. Just 16% of Germans who are not worried about a terrorist attack share this view. Americans traditionally have had more sympathy for Israel than the Palestinians in the Middle East conflict. These attitudes have remained fairly stable for more than two decades. Pro-Israel sentiments have grown even stronger at times since Sept. 11, and since then support for Israel has never fallen below pre-9/11 levels. Europeans, by contrast, voice much more sympathy for the Palestinians. Roughly four-in-ten Americans (41%) say they sympathize with Israel, compared with 21% who voice sympathy for neither side and just 13% who side with the Palestinians. Among European publics, no more than a quarter (in Germany) sympathize with Israel; in each country, the plurality is neutral or has more sympathy for the Palestinians. France has the most sympathy for the Palestinians – 36% side with the Palestinians, 25% are neutral and 19% express sympathy for Israel. In France, Germany and Great Britain, highly-educated people are much more likely to express sympathy for the Palestinians than those with less education.This is especially the case in France, where 51% of highly-educated people side with the Palestinians, compared with 30% those with the least education. In Germany, four-in-ten highly-educated people side with the Palestinians, compared with 21% of those with relatively little education. Education is less of a factor in Italy and Great Britain. And education has very little effect in the United States, where fewer than one-in-five of those in the high and low education groups say they sympathize with the Palestinians. In Europe, men are somewhat more likely than women to voice sympathy for the Palestinians. One-third of men in Great Britain say they sympathize with the Palestinians, compared with 23% of women; in France, four-in-ten men side with the Palestinians, as do 32% of women. In the United States, by contrast, men are more likely than women to sympathize with Israel. Nearly half of men in the United States (48%) sympathize with Israel, compared with 34% of women. Outside of Great Britain, European publics are generally critical of the Bush administration’s policy in the Middle East. People in Great Britain are divided on this point – 39% disapprove of U.S. policy, while 36% favor it. In the other three countries, people oppose U.S. policy in the region by at least two-to-one. In addition, there is a widespread sense that the United States is not doing enough to try to bring about a peace agreement in the Middle East. Solid majorities in all four European countries say the United States has done too little in this regard. Even in Great Britain, where support is highest for U.S. Mideast policies, most people (57%) say the United States has not done enough to try to achieve a settlement. Given those attitudes, it is not surprising that the administration’s recent foray into Middle East diplomacy has won wide support across Europe. Nearly nine-in-ten (88%) Italian respondents backed the recent administration efforts to broker a peace agreement, as did 76% of the Germans, 75% of the British and 67% of the French. In the United States, a 55% majority supports the administration’s overall Middle East policy. But there are partisan differences. Seven-in-ten Republicans (72%) support U.S. policy, while just half of Democrats and 47% of independents agree. Republicans also are much more likely than Democrats to say that the United States is doing all it can to forge a peace agreement (67% vs. 46%). But the administration’s recent diplomatic efforts win broad backing – 86% of Republicans, and roughly three-quarters of Democrats and independents, support the new diplomatic push. European opinion on a possible U.S.-led military operation against Iraq ranges from ambivalence (in Great Britain and France) to solid opposition (in Germany and Italy). By comparison, seven-in-ten Americans (69%) support taking military action against Saddam Hussein’s regime, which represents little change since January (73%). In all four European countries, younger people are much more supportive than their elders – especially senior citizens– of taking military action against Iraq. In Germany and Italy, more than four-in-ten of those under age 30 favor anti-Iraq military action; support drops markedly among those over 50. Only one-in-five Germans age 70 and over support military force, as do 30% of Italians in that age group. Age differences are not as pronounced in the United States, where there is broad support for the use of force. Despite the lack of broad backing in Europe for using force against Iraq, majorities in three countries say that evidence that Iraq is developing nuclear weapons, or weapons of mass destruction, would be a “very important” reason to take action against Baghdad. Only in Italy is there substantial dissent from this view; 49% there say learning that Iraq is developing such weapons would be a very important reason to use force, while 23% finds that not too important. At the same time, Europeans are less persuaded that Iraq’s involvement in the 9/11 attacks on the United States would be a very important reason for using force against Saddam Hussein’s regime. While 55% in Great Britain see this as a very important reason for taking action, fewer than half of those in France, Germany and Italy agree. By contrast, an overwhelming majority of Americans find either reason – Iraq’s possession of nuclear weapons, or its involvement in 9/11 – as very important justifications for military action.